1984 base coupe 17,000 miles all original. very low production number.red on red 3853. pro num. Posts: 125 I can give you a person's name and number if you want good OEM parts for c4's...that is all he deals in......I use him lots and he is outstanding. 96 Vette with extensive list of mods, many one-off and custom. Posts: 211 I'm watching program about whether the New York Times will fail. Not whether it's good or not but whether it is valued in the age of twitter. From Enron to banks, they can all fail. A C4 is a "has been" and now all the tech that was cutting edge is now just a problem to try to fix. The entire drive train is unique and obsolete. 9" Ford rears have been around forever for a reason. Dana 36's and 44's don't have any such reason. LS is the motor of choice in everything and C4's don't have one. 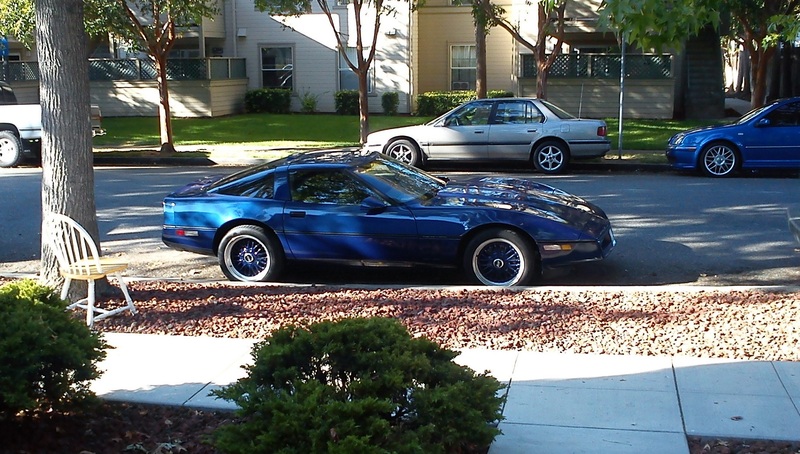 I work on my C4 all the time and I like it the better than any other but I absolutely know most car people including other Vette guys won't give it a second look. Any piece of junk mid year will turn more heads than mine even though I know there's no comparison. If a C4 turns your crank, then the cheapness is an opportunity because they are really still very close in performance to the very latest if you work on them a little. The only delusion is to think you're ever going to have a collector piece. Even the old time classics came back to reality when the guys that "had to have them" all died. Same with any car. Get over it! Who cares what its worth? Just drive the wheels off it and and like the zig zag man tells us (ENJOY). Thats what Iam doing with my black 94 ragtop, When I do part with it it will be worth what ever the new proud owner will be willing to pay at that time. Just enjoy your C4. Posts: 702 I wouldn't get too bent out of shape by some D-bag making a negative comment. I like my car, on the road or strip, and it'll be worth whatever somebody pays for it when I sell it. In the meantime, I enjoy my ride, as you should. Posts: 211 I don't think anyone is saying they will loose their entire value, they just aren't going to increase as a "collector" like 65-67's. I expect them to a flat line between $5K & $10K and there's lots of reasonable cars there now. Seems like all new Vettes are devalued at $5K per year until they hit bottom. ZR-1's went the same way, so you got to wonder where the new ZL-1's will be in 10 years. I'll bet nobody will be spending $50K for one by then. You have to figure if there are new Vettes, hybrid is in their future. Won't that be a kick where it hurts. 1995 Coupe Red, automatic, all original, haven't changed a thing -- except the tires, battery, stuff like that. You know what I mean! If our C4's aren't worth anything then why are people - yeah, other Corvette owners too - always complimenting me on my Vette. I have been offered $10000 for mine and it isn't as nice as some of the other C4 Registry members. The guy who told you this probably has never owned or driven one. Posts: 280 I may be thinking differently but in my mind if you are looking at $$ value to legitimize your investment, then you own a Vette for the wrong reason. Vettes, all Vettes, should be owned by people that appreciate the car for the ride, the response, the ability, and the pure styling of a one of a kind American Sports Car. The only dollar value I put to my car is the one it took me to buy it and own if for myself. I am not a great mechanic, hell i'm not even a good mechanic, I generally have to pay for my repairs to get done right, but I simply love the way this car owns the road and it's worth it to me to own one. I may never get my money back, but I will always be able to say "I own and drive a Corvette"....... Nuff said. Posts: 76 I fully dissagree that the C4 isn't worh anything. Prior to purchasing mine I conducted a lot of research and discovered articles from its the sexiest body style yet of the Corvettes to America's last real muscle car. Its the corvette the average person can buy, drive and enjoy without taking out a second morgage on their home. The C4 will always have personnel value in " that's my vette that everyone is looking at". So to me the C4 will always have value in years to come as an afforadable corvette and to me that makes it "priceless". I have a couple friends that own and operate C3's and they admire my C4 and are looking at purchasing one for themselves. So enjoy that C4 believe me its worth a lot and will remain valuable. Posts: 1363 the only way to say it is this way.... the value of ANY corvette (or any car for that matter) is the value it's owner puts on it. what may not be worth anything to someone may be worth a lot to the owner. my two corvettes are priceless to me. someone else may see them and say they are worth nothing. all i know is i love them and that what matters. just a footnote here...there are very few people around that have not like either of mine and most have told me they would love to have them. just my opinion. Knowing that I own her is PRICELESS! Posts: 1 i have to agree with som many of the others here about the value of a car. my 88 is also my first Vette. all i can say is a LOVE this car! and since i paid absolutely nothing for it (won it in a raffle) anything i've put into it so far has been affordable. i think the word value is the wrong one here. people should be talking about the worth of the car. value is a subjective thing, according to who is looking at the car. i could have sold it for $6000 the day i won it. i didn't. the car had much more value to me then that, regardless of what its worth. its pure pleasure to drive. and its a work in progress. Posts: 13 When I got mine lots of people said the same thing but they also add it sure is beautiful, nice car and it's a Corvette. My friend has a SL 550 2009 new it was $98,000.00 Today it's worth 25-30 but he loves it. I can work on my "88. He can't work on his or find any affordable parts but I can! Give it a few years. I thought I stole mine at $5,000.00 but would not sell it for 10K. You just fall in love. Same thing happened to the C3 20 years ago and you can find them fairly priced if you look. If you let price bother you go spend a lot of money and be happy. But make sure you buy a CORVETTE, true American sports car no matter what year!! Posts: 5 When I first got into the car hobby 30 years ago starting with a 48 chevy coupe, I did not do it because I thought I could make money at it. Anyone that might think this way is in for a surprise. As with many things it is not the buying it, it is the owning it that is costly. I had a buddy that owned a 1947 Luscomb two place airplane. He paid $8,000 for it but in a few years he had to sell it because of the upkeep costs were more than he could handle. He sold it for $10,000 5 years later. If he made money on it is questionable. You own a corvette because you enjoy it. What concerns me more is the age of the car people. Around here most of them are over 45 and counting. I am not seeing the interest for collector cars in the kids under 35 for instance. Posts: 11 The C4 is a great car and they are a tremendous sports car value right now to buy. The values are not there right now, but they will come back in time. I recently traded my 95 for an 08 and took a nice big loss on a perfect C4, but I had to have this newer one I guess. I love the C6, but there is something about the C4 I miss. It's more of a classic muscle car. For all it's quirks, squeaks, rattles, I miss it. I wish I could have kept it and had both.